Bag Tag - - engraved with your custom message. 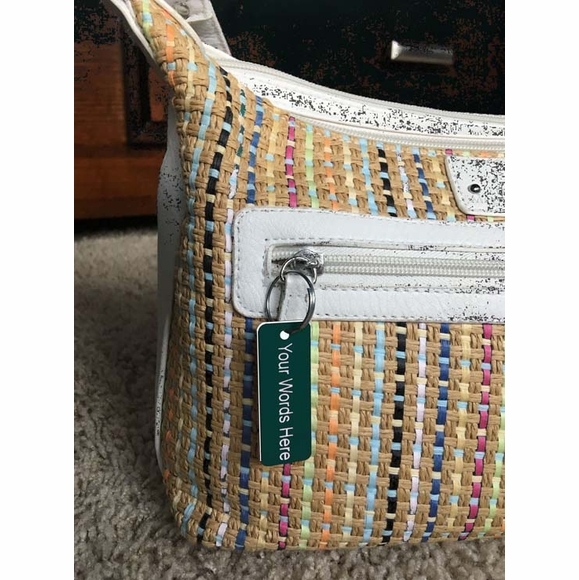 Decorate your bag with a personalized bag tag containing whatever message you wish to say. Attach it to your bag's zipper, strap, or loop with included stainless steel 3/4" split ring. Display today's trendy saying, slogan, quote, #hashtag, instagram user name, address, ham call sign, boat name, identification number, dog or cat name, favorite sports team name, band name, etc. For your backpack, gym bag, hobby bag, tackle box, tote bag, pocketbook, zippered pouch etc. Up to ten (10) engraved characters per line. Comfort House # J0079 by Shaya's Tags. The Comfort House Bag Tag makes a budget friendly and special gift for friends, nieces, nephews, nannies, teachers, household help, babysitters, caretakers, manicurists, beauticians, barbers, and more.